I've finished setting up my macro-table-on-the-cheap as an experiment and have been looking for subjects to play with. This one turned out not bad, with a couple of desk lamps as illumination the exposure had to be longer (about a second, hence the blurred second hand). Good! The blur on the second hand is interesting. Wonder if it means the hand shook back and forth when it ticked off a second. The image looks like a good start -- tolerably sharp everywhere it matters, and none of the blown out specular reflections that are common when shooting shiny glass. I suspect the lack of blown out reflections is due to showing only the bottom half of the watch. Based on shadows, the lights were above the frame, which means that their reflections would be from the top half of the crystal that is not in frame. Wonder if it means the hand shook back and forth when it ticked off a second. Another possibility is that this is a "sweep" second hand that appears to advance continuously, but actually advances a fraction of a second at a time in sync with the balance wheel. Andy, can you tell which it is by watching the watch by eye? Alternatively, can your camera shoot video that might be studied frame-by-frame? 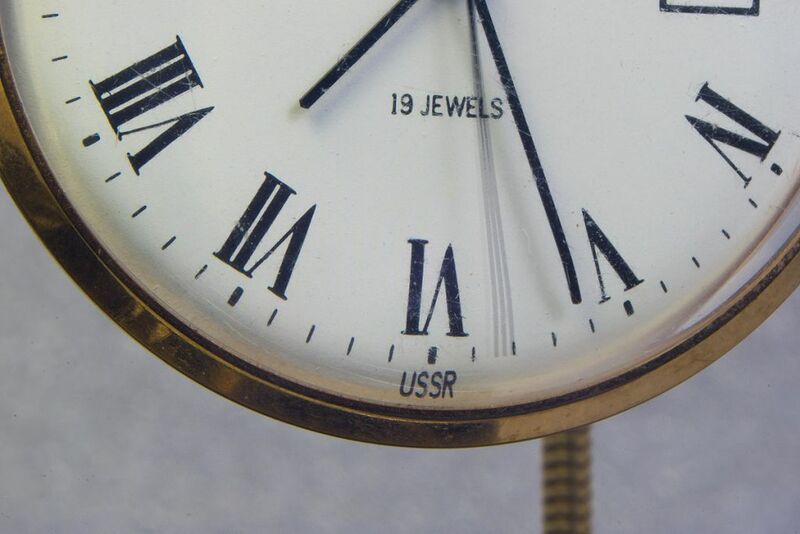 Thanks for the feedback, the second hand on a mechanical fob watch in this case is a "sweep" hand which moves in smaller than one second increments. With a long exposure time I reckon that is three increments that are shown. The lights in this case were indeed above the object. When I was a lad I played with repairing watches. Two of the common standards were "18,000 train" and "24,000 train". Those are 5 and 6.67 ticks per second.